Hummingbird Facts. 25 Amazing facts about these little birds. 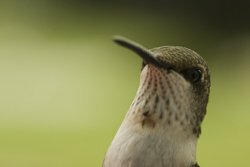 Here are 25 amazing hummingbird facts that will show how these little birds are one of most unique creatures alive and will capture your mind and heart! The hummingbird is the only bird that can hover indefinitely and fly backwards beating it's wings 70 to 80 beats per minute. Fun facts for kids, coloring pages, activities and a great gallery of hummingbird species photos! 1. There are 340 species of hummingbirds making them the second most diverse bird family on earth. 2. Hummingbirds do not produce musical sounds. Hummingbird sounds are often chattering sounds. Scientists often describe these sounds as call notes. We now know that some hummingbird sounds originate from their tail feathers. 4. Hummingabird migration - This is probably the most sought after of the hummingbird facts. Most hummingbird species cannot tolerate cold. Early and late frosts can take a toll on these little birds. That is not to say you will never see a hummingbird in winter. Scientists are beginning to notice the overwintering Rufous in some parts of North America. The Rufous hummingbird has the longest migration, flying as much as 3,000 miles from Alaska to Mexico. The Ruby-Throated hummingbird also has a long migration route which includes the incredible task of flying 500 miles nonstop across the Gulf of Mexico! 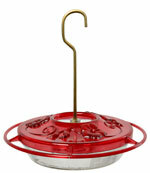 Don’t worry, hummingbirds usually return to the same feeder every year. 5. Hummingbird mating involves incredible diving rituals. A male will mate with more than one female. The female chooses whether to accept the males. She usually bases this decision on whether or not the male has acquired a suitable territory for the sustenance of her offspring. 7. 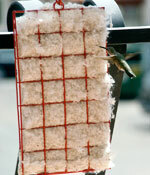 The hummingbird nest are built by the female alone. They are a wonderful piece of architecture that is not only tiny but also flexible. They expand to accommodate the eggs and then later reduce in size once the fledglings have left. Would you like to learn how to find a hummingbird nest to witness the amazing birth and first days of a hummingbird's life? 8. Hummingbird eggs are the smallest in the world. The baby hummingbird usually hatches within a few weeks depending on species and weather. 9. The hummingbird species has the renowned honor of including the Bee Hummingbird of Cuba, the smallest bird in the world. 10. The gorgeous plumage is well admired. The male Ruby-Throated Hummingbird was named because of the iridescent feathers on its neck which reflect sunlight at different angles. In spite of the jewel like colors of hummingbirds, their visual beauty is an optical illusion. The feather pigments are black, brown and reddish brown. A hummingbird’s feather can reflect light resulting is remarkable color. 11. White hummingbirds (Albino hummingbirds) and semi-white (Leucistic hummingbirds) do exist lacking all or nearly all pigment in their feathers. 12. Hummingbirds have the least amount of feathers of any bird. They have only 1000 to 1500 feathers. 13. Hummingbird flight is special because their wing anatomy allows them to fly forward backwards, upside down and hover in place. 14. One of the most unique hummingbird facts is in regard to flight. They are the only birds that can hover indefinitely. 15. Unlike many birds the plumage of hummingbirds does not change during breeding season but remains the same year-round. 16. Hummingbirds spend an unusual amount of time cleaning (preening) their feathers. The condition of the hummingbird’s feathers is a life and death issue. They need to remain extremely light in order to achieve the flight dynamics that keep them alive. 17. A hummingbird can beat its wings 70 to 80 beats per minute. 18. Hummingbirds molt (lose old feathers and grow new ones) yearly. Once in a while I find a tiny hummingbird feather. You can keep a look out too. They are tiny and hard to see. 19. Hummingbirds live on the edge of survival and can starve to death in 3 to 5 hours. 20. Hummingbirds digest their food in 20 minutes with great efficiency. They extract more than 90% of the sucrose and eliminate the water. If you have ever watched a hummingbird perch, you now know that they are not resting but busy digesting food. 21. 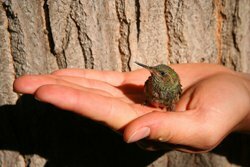 Hummingbirds have the largest heart of any bird for its size. Its heart rate is often more that 1,200 beats per minute. 22. 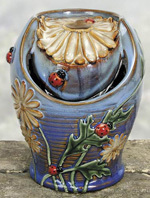 They have an ability to pollinate flowers which co-evolved with them. Over thousands of years hummingbirds fed regularly on the nectar of plants for the energy they needed to survive. The plants evolved with them, gaining flowers with long tubular shapes to fit the bills of the marvelous birds. 23. The hummingbird family, Trochilidae, is in the order of Apodiformes. Note: Scientists classify birds based on their anatomy and biochemistry. 24. Believe it or not, there are hummingbird predators such as the praying mantis, the dragonfly, the robber fly, certain spiders, some frogs, and larger predatory birds. 25. Much information has been gathered and documented through a process of Hummingbird Banding by licensed banders. These hummingbird facts have historically intrigued humans for centuries past and continue to intrigue to the present day. As we continue to learn about the hummingbirds through ornithological studies, banding, and greater correspondence among enthusiasts, our knowledge and marvel about these birds should increase. Hummingbirds are considered to be a bird of the Americas. They range from southern Alaska to the Caribbean. Most species live in tropical Central and South America. Only the migratory Ruby-throated Hummingbird breeds east of the Mississippi River and the Great Lakes. Among the number of species that breed in the West is the Black–chinned Hummingbird. The Rufous Hummingbird is the most widespread in Western Canada. There is a history between humans and hummingbirds. Their beauty, fearlessness, and other unique qualities have led to a great fascination about these birds. 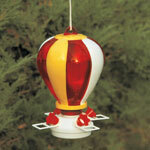 Many people observe hummingbirds directly in their backyards. Some enthusiasts set up nature cams which will bring live video of hummingbird activities right into their living rooms. Others participate in research while many will travel on bird watching tours. We hope that these hummingbird facts that we all have learned, can enable us to co-exist without harm for many more centuries to come. Get a custom made tshirt.